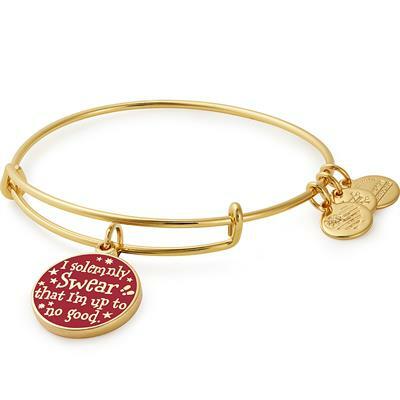 This shiny gold Alex and Ani bangle is the perfect gift for any Harry Potter fan. It features a double sided charm, with one side saying 'Mischief Managed' and the other saying 'I solemnly swear that I am up to no good'. These are the spells that are used to open and close the Marauder's Map. Pair this bangle with others from the Alex and Ani Harry Potter collection for the ultimate stack!